Y’all should know by now that I love love hosting parties at my house, and if I could do it full time and get paid for it then I totally would. I had the joy of co-hosting a Kentucky Derby watch party with one of my favorite gal pals, Carmen. Her home is always decorated to the nines with every season, she is my home decor spirit animal. This year the party gods decided that Cinco de Mayo and the Kentucky Derby should be held on the same day. Leaving us with so many theme choices that we could barely contain our little closet-party-planner selves. 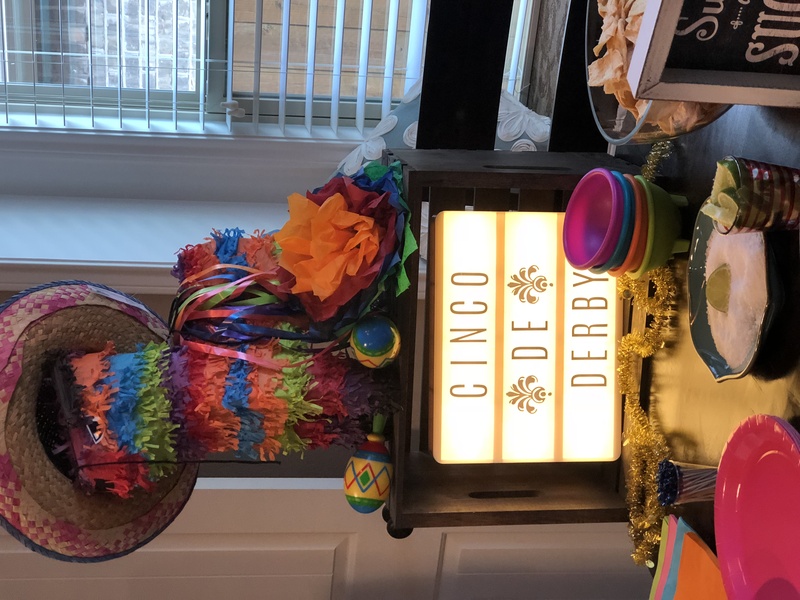 We decided to combine the two themes and name the party “Cinco de Derby – Off to the Races.” Guests were encouraged to dress in Derby attire and in true Derby fashion the over-sized hat was a must. Anytime I throw a party I take on the challenge to find the best decor, but at bargain prices… it’s a hunt and a badge of honor that I wear proudly when I conquer this challenge. The dollar store is always my go to, looking for items that I could re-purpose, paint or tweak just a little to make a show stopping presentation at the party. I have to say y’all I cleaned up this year at the Dollar Store, spending only $50, I bought the cutest accessories that just made the whole party sparkle. Dollar Store Finds: Silver picture frames that I used throughout the decor to display fun party printables. 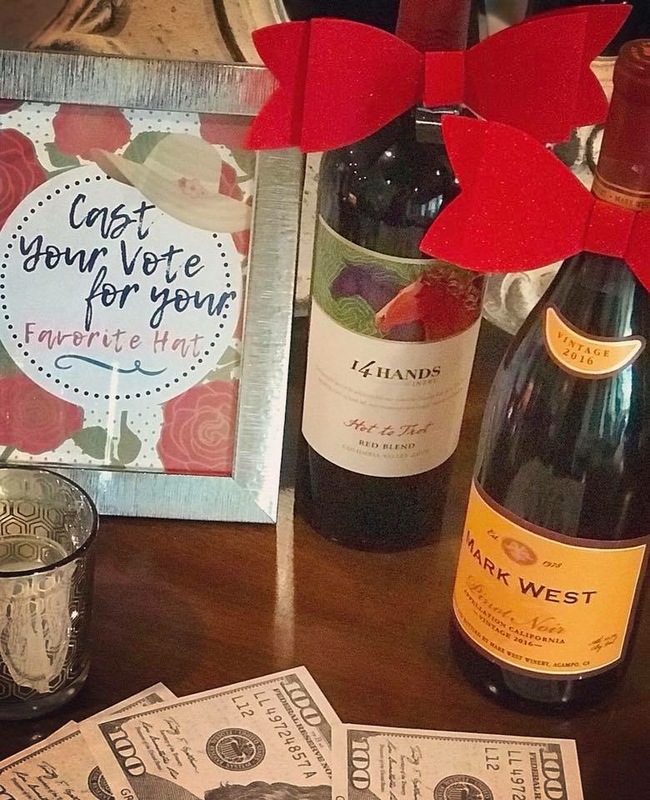 Silver candle votives, over-sized play money, silk red roses, dice and my personal favorite the red bow ties to add to the bottles of wine. 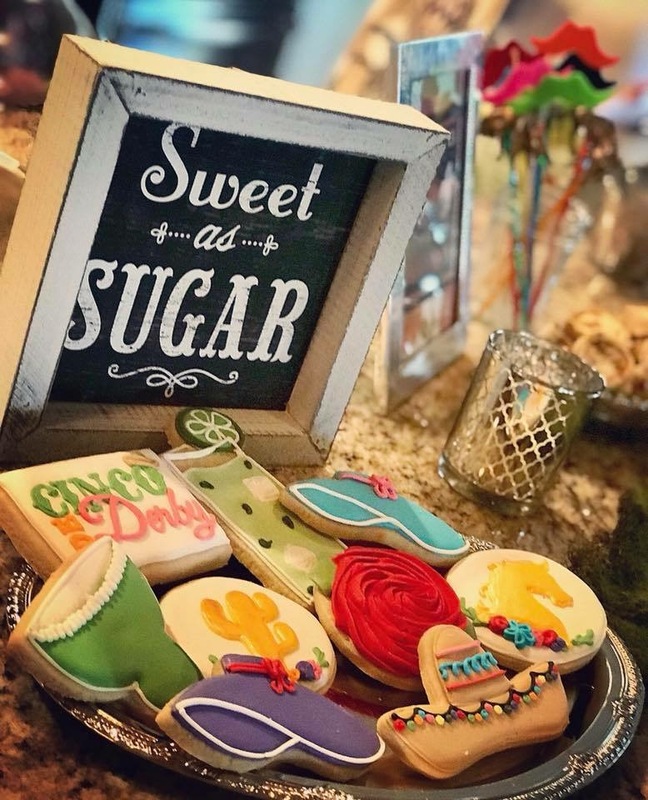 One of my signature party planning “moves” is to always have a custom sugar cookie that goes with the theme. I am so blessed to have found Elise with Sweets by Elise, she is a cookie artist and she always comes up with the most clever cookie designs. This party theme was more of a challenge, but she rocked the cookies… and yes they tasted just as good as they look. We really went over the top on the food, but I’m not sorry. 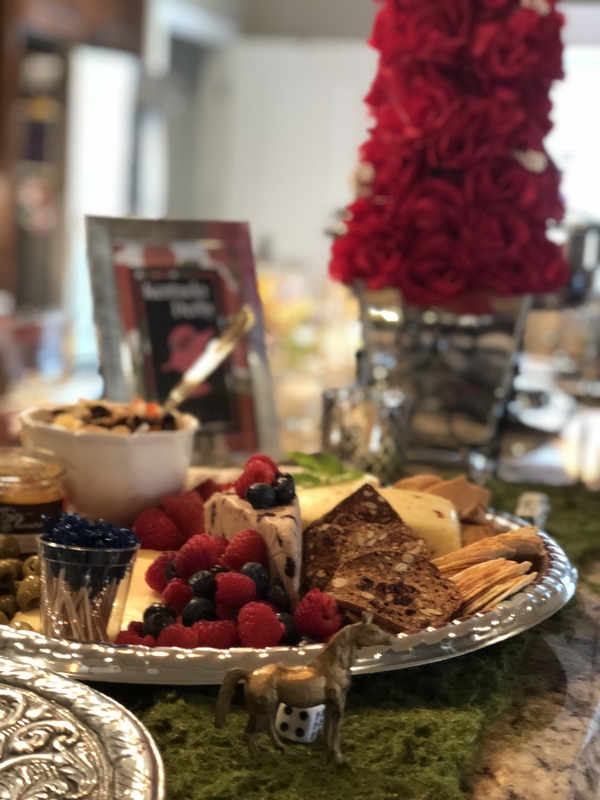 We planned a beautiful charcuterie tray that was adorned with fruit, we even selected cheese infused with fruit and stayed with the fruit inspiration all the way down to the lemon biscotti. To incorporate the Cinco de Mayo theme, beyond the sugar cookies, we had a seven layer dip, queso, and taquitos. I also made my famous “Larry’s Pinwheels”, if you want the super simple recipe check out my blog post from My Favorite Things Party. Spray painting dozens of tiny plastic horses from Dollar Tree was probably my favorite project for this party. P.S. I found faux grass runners at JoAnn’s Fabric Store, this was my splurge item, but totally worth it! Larry’s Famous Pinwheels and more of my spray painted dollar store gold horses! I used Canva, the free online design platform, to create four 5 X 7 images to frame and display throughout the party. The framed images helped define spaces and create a Derby atmosphere. Y’all I found the perfect Derby dress at a new local boutique in town called Coterie Boutique, I fell in love with it and just had to have it! Now my only problem is that I can’t find enough places to wear it to! 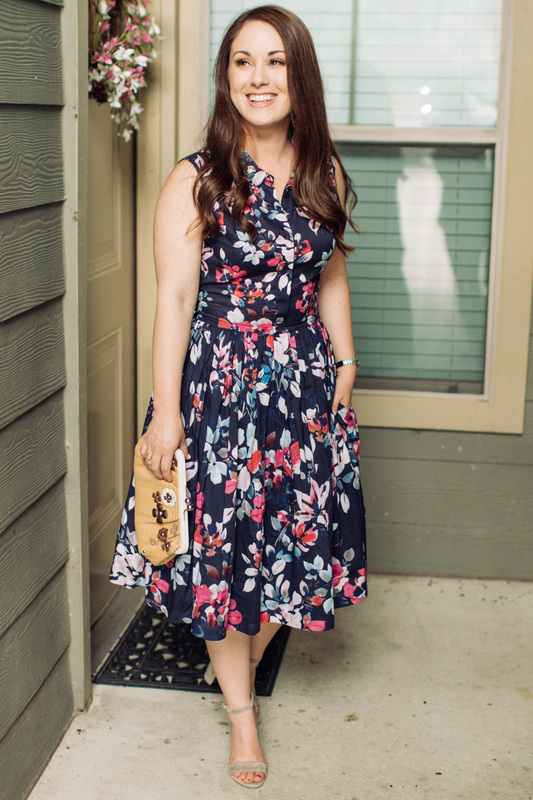 Perfect for Spring and perfect for a day at the Derby, I felt beautiful in this dress… p.s. it has pockets (in my Oprah voice). Next Post Wine on the go! I have been wanting to attend or throw a Kentucky Derby party for years!! How fun!! It’s on my bucket list to go to the Derby! 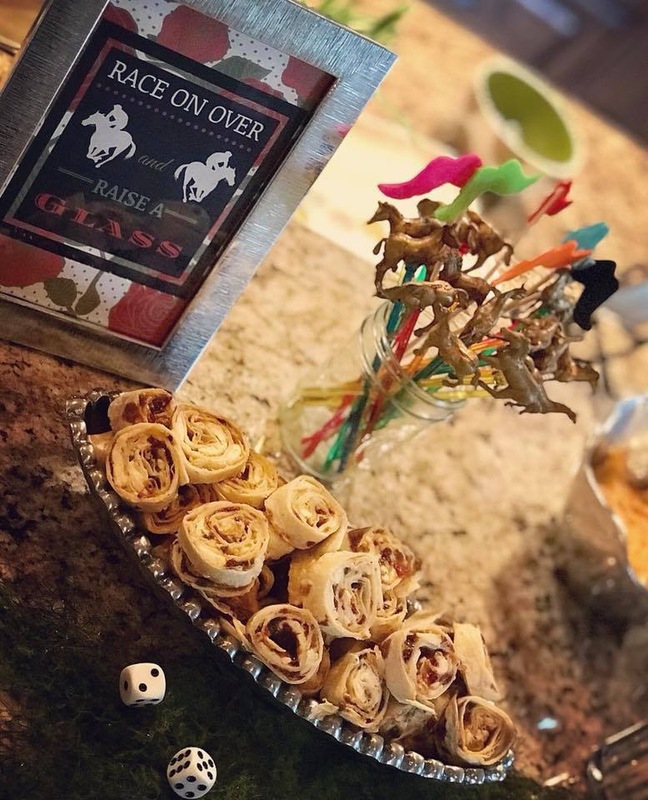 We had a blast throwing a Derby party, I actually co-hosted this with another friend and I think that was really helpful because there were a lot of details!